I earned the two most significant titles of achievement in my life on the same day: surgeon and mother. I was taking the final exam required for my certificate to practice surgery when I went into labor. I finished the exam, then went directly to the hospital where I delivered my first child! It was a day I will never forget and the timing of those two events helped lead me to join International Medical Corps. My husband and I decided I should stay at home for six months so I could exclusively breast feed our new-born son, Sam, and it was during this time that my husband saw an International Medical Corps advertisement seeking an assistant for a new Health and Nutrition program. It seemed like a good opportunity because the job would give me a period of stability with Sam that working as a surgeon could not offer during the critical first two years of his life. I knew my first priority was to lay the foundation of a healthy life for my baby, although I was concerned International Medical Corps might not want to hire me since I had no field experience. I was surprised and excited when I received a call from the organization’s ’s Aden office in May 2014, inviting me for an interview and to take a written test. I passed both and was offered the job, but I was still worried because I had never worked for a humanitarian organization before. I found it difficult at first, but I was lucky to have a wonderful team of colleagues I could go to for help. I will always be grateful for the guidance and support extended to me by the program managers, area coordinators and others in the office. Whatever success I’ve had is because of the support they gave me at the start. 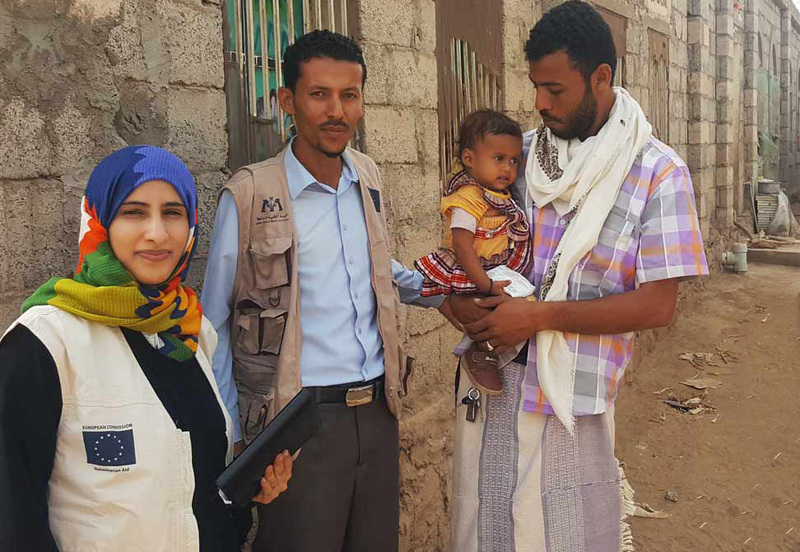 International Medical Corps began working in southern of Yemen in 2014 when it implemented health, nutrition, WASH and Food Security programs in Lahj Governorate, an area which borders Aden. It ranked among the areas most severely affected by the country’s nutritional crisis, with more than half the population designated as food insecure. Unstable security conditions prevented us from opening a sub-office in Lahj, so we had to operate the program from Aden. Learning how to balance my life with the demands of a new job and a new baby was also a personal challenge for me. Sam was seven months old when I began work and he was just starting on complementary feeding, so suddenly I was having to do things at my new job and as a new mother and had no experience with either one!. Without the support of my husband, my parents and the rest of my family, I wouldn’t have been able to make it. The goal of the Emergency Nutrition and Health Support program I worked on was to reduce the mortality and morbidity of vulnerable groups in Lahj, including pregnant and nursing women and children under-5, by improving their nutrition and health status. To address these issues we implemented cost-effective services centered around a community management of acute malnutrition (CMAM) program, drawing assistance from the community so we could target the most vulnerable. We also began to address underlying causes of malnutrition through health and hygiene promotion, encouraging access to health services and the piloting of livelihoods projects. We worked through 18 existing health facilities, integrating CMAM components into their work and providing effective health care. We used mobile medical teams where no health facilities existed and also used a network of Community Health Volunteers (CHVs) to promote awareness, build knowledge at the community level, support vaccination campaigns and refer sick or malnourished children for treatment. We started three years ago as a primary health care health program operating in 18 health facilities in Lahj. Today, I am proud to say we provide both primary and secondary health care in 40 health facilities in both Lahj and Aden and have more donors supporting the program with more funds. But for me personally, I am even more proud that—under very stressful and difficult conditions—we were-able to preserve the continuity of program itself–to keep it going despite the outbreak of civil war and despite the fact I and my family were forced to flee our home in Aden and become ourselves one more number in a registry of IDPs at a time I was responsible for helping so many other IDPs in the course of my work. In the face of it all, it was also a time when I was able to improve my skills professionally and grow in my personal life. Yes, there have been many crises, but there have also been positives in my life. Today, unfortunately many challenges remain and Yemen suffers greatly. It is difficult to convey just how bad conditions here are. The basic national infrastructure no longer functions. We try our best to begin a recovery and start again, but the health system is largely destroyed. We’re experiencing a major cholera outbreak, and a fuel crisis has led to electricity and water shortages. A lot of things have hit my country in the past few years, but we are not giving up. We are trying to gather our strength, to pick ourselves up and move forward. We cannot let go of the hope that conditions will improve. I’m sure that one day we will achieve our dreams, that Yemen will become a place of peace and good health—for my children and all Yemeni children. I cling to that hope. Editor’s note: much as working mothers everywhere, Doa’a Kutbi frets about getting the balance right between work and family. But for Doa’a, who serves as a health program officer for International Medical Corps in Yemen’s southern port city of Aden, striking that balance is especially challenging. The younger of her two sons was born with a cleft palate and has required the additional care required from the mother of a special needs child. At the same time, her work unfolds amid a crushing civil war that has brought with it enormous human suffering—especially for mothers and their children. Since returning to work after the birth of my second child last autumn, my life has become a daily marathon. I try my best to maintain a balance between family and work, but as any working mother knows, it’s difficult to do. My little son, Islam, is now nine months old and because he has a cleft lip and palate, I faced real challenges trying to nurse him. Even with an artificial palate, he hasn’t been able to feed with comfort. As you can imagine, for me as a doctor who has worked hard to make mothers in my community aware how important exclusive breast feeding is during the first six months, the fact I haven’t been able to do this for my own son has been hard for me emotionally. Still, I feel I have grown from it all. For example, when I see other mothers in my community struggling, I feel I have been able to draw on my own personal experience. I know first-hand now what a young mother feels when she cannot provide fully for her child, or what it’s like for a mother who has given birth to a special-needs child—especially when it is something that complicates initial breast feeding, such as a cleft lip, hypotonia (reduced muscle control), or tongue tie (where the tongue is “tied” to the floor of the mouth by a short strip of skin) or simple premature birth. These issues have led me to focus more than usual on our Infant and Young Child Feeding Program—IYCF. It is a program International Medical Corps offers in several forms, such as using our mobile medical team, in awareness sessions conducted by community health volunteers, and at health facilities using a designated IYCF corner. As a working mother, this all generates positive energy for me. It is motivating. It forces me to be creative and teaches me how to handle stress, how to prioritize and yet still be able to balance life’s priorities. Of course I’m very fortunate to have such a supportive family. In addition to my husband, Islam and three-year-old son, Sam, our household in the Crater District of Aden also includes my mother, father, younger sister and brother. When Islam was six months old, my husband and I decided we needed to arrange an initial surgery for him—the simplest in a series of operations he will need. After visiting several facio-maxillary specialists, we decided on Dr. Ali Monasar and to our great relief, his operation was successful. Even so, the three-hour operation and the month-long recovery when he could only be fed by syringe was one of the most difficult and painful experiences of my life. It was also a reminder for me of the medial challenges here in Yemen. We still have qualified doctors here, but we no longer have functioning hospitals or an integrated complementary health service. Ideally, my baby’s treatment would have a committee of doctors, including a facio-maxillary specialist, a dentist, a nutritionist, an ear nose throat specialist and a speech therapist. 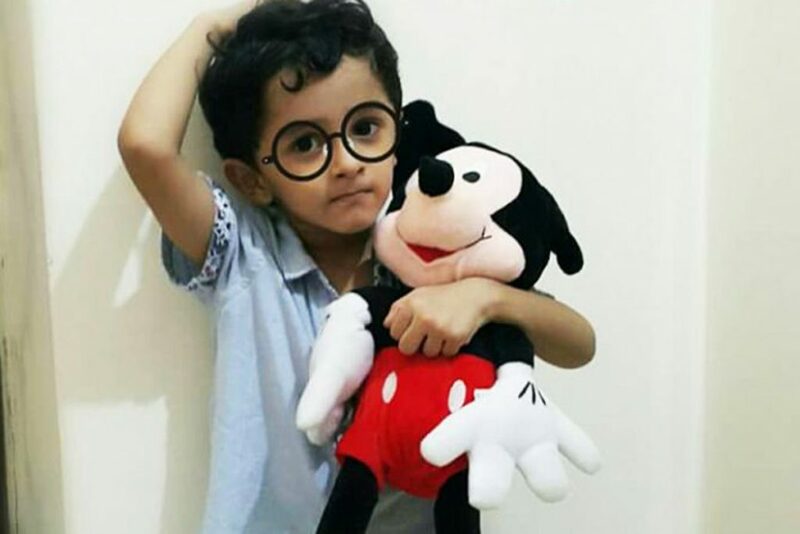 Because there isn’t that capacity in Yemen now I plan to take him to a country elsewhere in the region. when he reaches 18 months so he can get such treatment for the second and third operations he will need. Until then, my concerns as a mother for my family are much the same as for other mothers in Yemen today: we want shelter and safety from the war going on around us, and health care services that can function normally and protect us from the recent outbreak of infectious diseases that have settled into the country. This includes not just the world’s largest outbreak of cholera that by mid-August had affected more than 500,000 people, but also lesser known diseases such as measles, meningitis, pertussis, dengue fever and typhoid fever. One of my biggest worries is that people outside Yemen don’t realize how desperate our situation here is—that even if our health care system can take the first steps toward improvement, there is so much still needed in order to fill the gaps and to rehabilitate our infrastructure so it can support sustainable programs for development. Editor’s note: As Yemen’s civil war approaches its third year with no end in sight, wide spread devastation has forced millions from their home, and the worsening nutrition situation is threatening more lives than ever before. Mothers and young children are among those most seriously affected. Doa’a Kutbi, a health program officer who works from International Medical Corps’ office in Aden, has been caught up in the conflict from the beginning. She recently returned to work following a two months leave of absence after giving birth to her second child. This is her first blog entry since resuming work. Doa’a with beneficiaries in a village near Aden. Life has changed for us in Yemen. Health services have been disrupted and there is a lot of malnutrition, especially in the villages. It is difficult for pregnant women to reach hospitals and access healthcare services that they need in order to deliver safely. After giving birth to my second son, I can only work five hours a day – but being a mother has given me a positive energy that has only motivated me to work even harder. I now understand other mothers better. I can feel what they feel. I know their struggles and I am living the same life they are. I am in the same situation as the people I support. My new baby, Islam, was born with a cleft palate. I knew something was wrong when instead of bringing my baby directly to me, they took him to an incubator right after the birth. My older son, Sam, suffers from a mild congenital heart malformation, so I was terrified. When they told me that he was born with a cleft palate I felt relief – as a doctor and a humanitarian who works with mothers every day, teaching them about the right breastfeeding practices, I knew I could handle this. Still it has been difficult–hard not to be able to provide what my son needs. Islam is three months old now, and it is getting easier. However, this experience has helped me understand the needs of other mothers, who, like me, are unable to get specialist treatment. 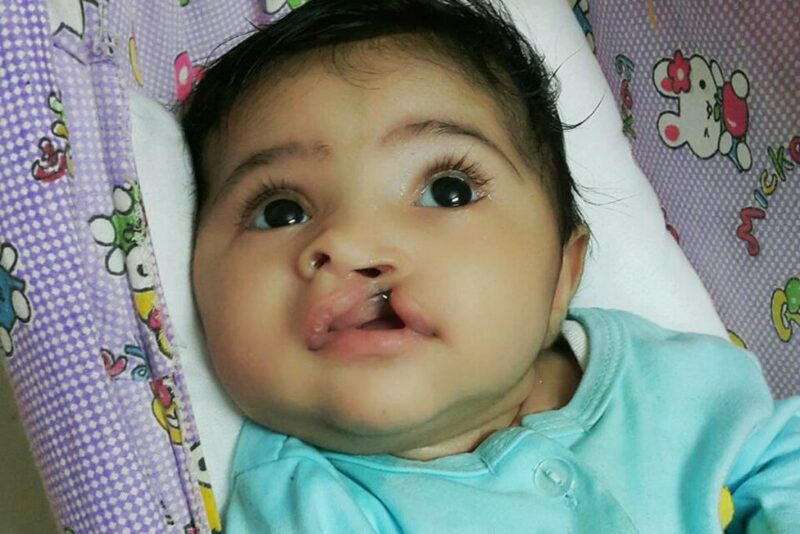 Having a child with a cleft palate makes breastfeeding even more difficult and there are no surgeons left in Yemen to provide the kind of (corrective) operations required. International Medical Corps runs infant and young child feeding (IYCF) corners in various health facilities in Lahj and Aden, which support nursing mothers, teaching them about the importance of breastfeeding. Here, women can also breastfeed in privacy while waiting for their consultation appointment. I am now looking for ways to improve and strengthen these breastfeeding corners to support women who have difficulties breastfeeding and provide counseling for those who need it. I am also hoping to find a donor who can support surgical camps here in Yemen- especially for those suffering from serious medical issues who have no access to qualified surgeons. International Medical Corps, with support from the European Union, already provides ambulance services from health facilities to secondary healthcare providers, ensuring round the clock access to obstetric and newborn care, as well as other emergency healthcare. Doa’a with the International Medical Corps Aden team preparing for a trip to visit beneficiaries. Just as being a doctor helps me work with my son’s condition, so does being a mother help me with my job. Every day I work with other mothers and their children. Every day I am able to help women on their amazing journey during pregnancy to caring for their baby after delivery. Still, my life feels like a marathon as I try my best to maintain a good balance between my family and work. I am so grateful to my husband and my parents whose support makes this possible. It is difficult to be away from my children, but I am confident that one day they will understand the importance of the work that I do for my community, and that they will be proud of their mother. Editor’s note: After being forced to flee their home in early May of 2015 and live as IDPs (internally displaced persons) elsewhere in Aden for three months, Doa’a, her husband and young baby were able to return to their apartment in the city’s Touwahi neighborhood late last summer. Now they are preparing to move again as they prepare for the birth of their second child. Although instability continues to plague the city and several militant groups have established a presence there, Doa’a and her International Medical Corps team colleagues in Aden continue to deliver life-saving assistance. This is her first blog entry since last March. We hear news of major air strikes in and around (the capital) Sanaa, but Aden remains relatively calm. There are occasional attacks in the city by small groups and you can hear gunfire or bombings, but overall, Aden is quieter than it was when I last wrote in March. In the past week, a soldier was killed after unidentified armed men opened fire against a military checkpoint in the Mansoura district and airstrikes east of the city itself targeted a group of suspected Al Qaeda members. Still, it is possible to move around within Aden safely and even venture outside the city itself. Supplies of both food and fuel have improved and our programs continue to operate. Next week, my husband and I, along with our nearly 3-year-old son Sam, will be leaving our neighborhood of Touwahi, and moving to a new part of the city called Seera,-about four miles away. We’ll have a newer, bigger, house there, but that’s not why we’re moving. The problem in Touwahi is water—or the lack of it. In our new neighborhood we will have eight hours of running water every day. In Touwahi, there is eight hours of water, but only every two days. Water storage is also an issue in Touwali. The way it is stored here makes it relatively easy for mosquitoes to breed that carry dengue fever, so health is also involved. I like to talk about the International Medical Corps team here as my second family. We must all pull together because the work we do is neither easy nor risk-free. We continue serving a total of 46 Health facilities and other health facilities in Aden, Lahj and other areas nearby areas. The facilities were selected to ensure broad geographic coverage across vulnerable and conflict-affected communities whose access to health care services has been severely disrupted by the war. Malnutrition was a problem in many parts of Yemen before the war began and the violence has only made things worse. We continue to support facilities in our area that offer treatment to those affected. To expand our coverage, our mobile units are now getting involved, offering outpatient treatment to those in need and tracking and following up on cases not previously detected. In other steps, we are strengthening those areas in the health facilities we serve that focus solely on infant and young child feeding and are integrating breastfeeding messaging into our nutrition activities. We are also using existing relationships we have developed with community health volunteers to bring new cases to the attention of our mobile teams and nearby facilities for treatment. We continue with our work against a backdrop of violence that is never far away. Despite this, I carry the hope that this war will end soon. I would love to plan for our future and for the future of our children, but for now, conditions don’t permit that. Still, I continue to hold the dream that Sam and his brother will be able to grow up in a safe place, that they will have all they need and will not have to suffer any more. 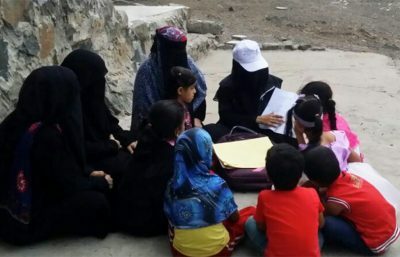 Editor’s note: After being forced to flee their home in early May of 2015 and live as IDPs (internally displaced persons) elsewhere in Aden for three months, Doa’a, her husband and young baby were able to return to their apartment in the city’s Touwahi neighborhood in the late summer. 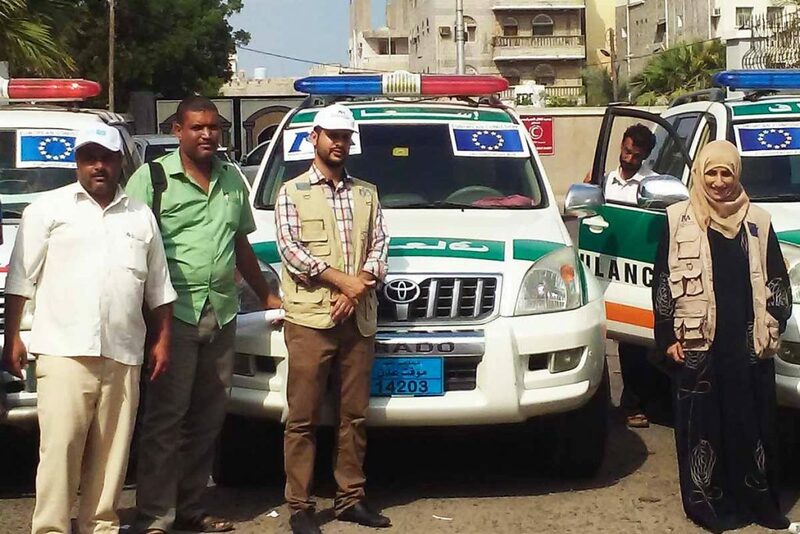 Doa’a and other members of the International Medical Corps team in Aden have also been able to return to their office in Aden, located in an area that had witnessed some of the city’s heaviest fighting. Although instability continues and several militant groups have established a presence there, Doa’a and her International Medical Corps team colleagues in Aden continue to deliver life-saving assistance. This is her first blog entry since last December. In the three months since I last wrote, life in Aden is getting better, but the security situation is far from stable. This lack of security weighs heavily on my mood, especially when a bomb explodes suddenly or when someone is assassinated. I still have flashbacks about what I experienced during the battle for Aden last year. They make me cry. I also feel horrible after any assassination or explosion. I try to keep my focus on my work with International Medical Corps, which is especially valuable at this time. In our collaboration with the World Health Organization and the National Government Health Offices in the different governorates, we have been able to conduct both epidemiological work and sprayings to combat the spread malaria and dengue fever. We have also begun working in the secondary health care sector–especially the emergency units that help wounded soldiers and other war-affected individuals. It’s a good feeling to know that I’m doing something positive for Aden—and for Yemen. I am now able to buy all the basic needs for my (2 ½ year-old) son, but I worry about him because of all that is going on around us–explosions, assassinations and shootings that could hurt him at any time. Schools for older children are open but they miss many days because of sudden outbreaks of fighting or other more general instability in the city. On the brighter side, a number of damaged schools have been restored. Many relatives and friends have now left Yemen because of the general security situation, but we keep in touch as best we can. I miss them a lot. Because of the instability in the city, we weren’t able to celebrate New Year’s, but my family and I walked around our beautiful city of Aden which survives despite the destruction, saying goodbye to a sad and difficult year and welcoming what we fervently hope will be a better one. I wanted to close a sad chapter and start a new one, but progress has been slow. Although the war and the heavy fighting has moved on from Aden, I still cannot move freely and the situation remains fraught with danger. Since the new year began we have been living under a curfew and sometimes I get trapped by a sudden outbreak of shooting moving back and forth between home and work. We’ve also had to cancel visits to some areas because of security threats. Any travel between regions invariably requires a careful security assessment. We are fortunate to have a great security team with a superb, experienced security manager. International Medical Corps is currently working in two governorates in the south of Yemen — Aden and Lahij– and we’ve also started our activists in Dhale (Dali) Governorate. Security is unstable in all of these areas, however the intensity of the need for health care is great. High levels of malnutrition and infectious disease require our intervention in Dhale (Dali) as soon as possible. While food and water are available again, water shortages persist. But now the greater problem is a dramatic increase in prices. While our family can keep up with rise in food costs I am very worried about the impact on the health of poor and low-income families. Unfortunately, power outages also persist and I fear it will be a very hot summer. Overall living conditions tend to worsen during the summer, which of course will also have an impact on the health of the elderly who suffer from chronic diseases like high blood pressure and diabetes. At the same time, the ongoing water shortages constitute the main reason for the spread of diseases. I’m concerned about the summer. Editor’s note: Following the intense fighting that gripped Aden during much of the spring and early summer, a brief calm returned to the city in late July as the major fighting moved northwest to Taiz. In the months since, fuel and food shortages have eased, however sporadic and unpredictable violence involving a variety of militant groups have left parts of the city nervous and on edge. After being forced to flee their home in early May and live as IDPs (internally displaced persons) elsewhere in the city for three months, Doa’a, her husband and young baby were able to return to their apartment in the city’s Touwahi neighborhood. 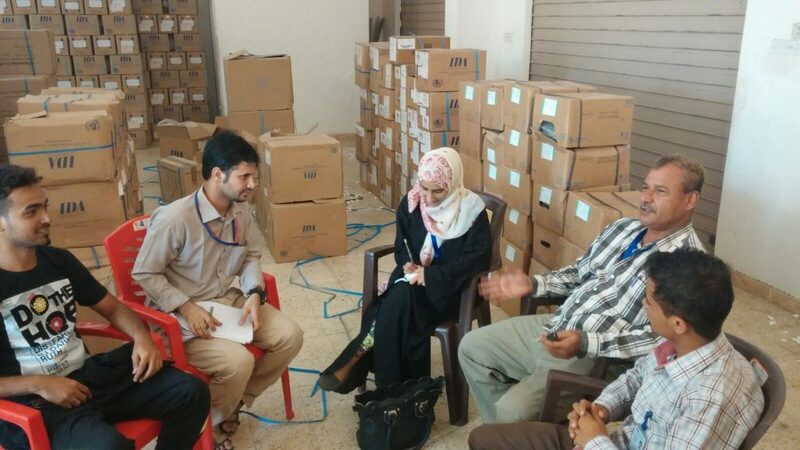 Doa’a and other members of the International Medical Corps team in Aden have also been able to return to the International Medical Corps office in Aden, located in an area that had witnessed some of the city’s heaviest fighting. Last week, the governor of Aden was assassinated. He cared about health and education in Yemen, so it’s frustrating for those of us who work so hard to deliver a high level of health care. I realize that life has to continue, but it was a shock, especially since he was killed in our own neighborhood of Touwahi. It was a large blast and the whole city heard the explosion. Rumors fly that terrorists carried out the attack. We’ll likely never know. What saddens me more is that Touwahi is no longer a secure place. Yesterday, our neighbor who lives only 70 meters away from me and my family was also killed. Masked gunmen entered his home and killed him. He was a bit over 50 years of age. I was in the office when I heard the news and immediately called home to make sure my family was all okay. My mother reassured me that they were fine and my dad was walking with my son in the neighborhood, but I was so scared that I asked my mother not to take my son out anymore. I am seriously thinking of moving to a safer place but I have a problem with such a decision: How can I leave my neighbors and my people and settle somewhere else? In addition to that, there’s important work here–training staff members at a local center on the management of severe malnutrition. We are providing skills that can save lives. Still, I’m unsure what to do. Most of my colleagues and friends are leaving the country. But I keep asking myself, “Why should I leave my country to these terrorists. If we all leave, they will control it.” I love my country and my people. I want to serve and help them as much as I can. Even though I have this attachment, I am still confronted with an inner struggle: to stay and help others means it’s harder to keep my son safe. I am lucky to be part of a great humanitarian organization that is supporting people in need. This keeps me going. One of the health problems facing the Touwahi area is a spike in dengue fever and malaria. We have coordinated with the local health department and launched a campaign that includes spraying in the area and conducting awareness sessions for residents. We have also trained 60 health staff members in how to prevent these diseases using World Health Organization protocols. Aden is relatively safe now even though we hear of killings and assassinations by unknown assailants. Despite the fragile security situation, our work continues. In fact, we are quite busy. We are currently implementing vaccination programs covering all of Aden and Lahj Governorates and working with different health departments, conducting awareness sessions about child nutrition and disease prevention. We are also preparing a major campaign due to start in early December to provide medical equipment to Sadaka Hospital in Aden. We used to support the hospital in emergency medicine during the war but now we will switch to emergency obstetric care. We are also going to support the hospital financially because staff member have not been paid for several months. We hope this will create an incentive for the staff to stay. It is very difficult when a nurse or a doctor doesn’t have the means to support their family. No one can work for nothing, so we hope this measure will help retain them. Another incentive is the training that we offer to the hospital staff. Personally, it has been very hectic at work and I’ve been having nightmares about the war. I recently went back to Inma, the area of Aden where we took refuge last May after being forced to flee our home during the fighting. It was tough going back. I remembered those very hard days and Syrians and Palestinians came to mind. I really hope they can soon return to their homes. No one—no matter who they are—deserves to go through the terrible experience of losing their home and being displaced. My son Sam turned two recently and to cheer us up, I decided we should celebrate, so I organized a birthday party and invited a number of children. It was clearly a success. We have to live despite the hardship. I just wish a better future for my son. I wish him safety and happiness. We have to build the future for our children. 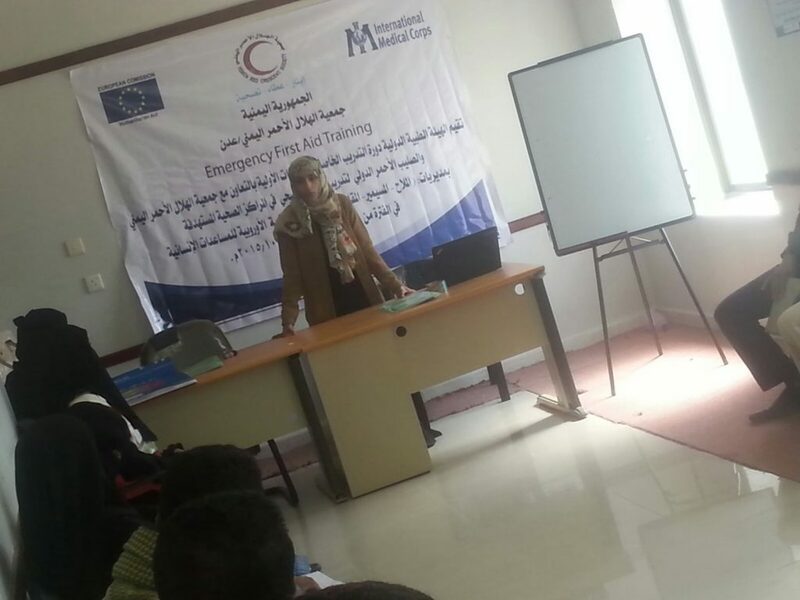 Yesterday I conducted training in emergency first aid in the Maqatra District (in Aden’s neighboring governorate of Lahj) for 16 participants from Lahj City. It has been difficult for us to reach these trainees because we haven’t been able to get to Lahj City due to the security situation there, so we asked them all to come to Maqatra which is a relatively safer place. Prior to this, we conducted identical training sessions for 21 people in Al-Milah (another district in Lahj Governorate) and for 45 in Aden. Doa’a at her training session. In Aden, my colleagues also trained 26 intensive care unit staff members in cardio-pulmonary resuscitation – which is also part of the emergency training curriculum. During my visit to Maqatra, we realized there has been a sharp fall in the level of immunizations. Making things worse, most medical centers in the area now have a shortage of vaccines. I called team members from the World Health Organization and asked for a meeting to discuss the issue. They agreed and I really hope we will find ways to end the current shortage quickly and also work out a plan to cover basic immunization needs for the longer term. While in Maqatra, I also visited Al Istiqrar Medical Center where I saw many cases of malnutrition and conjunctivitis. I organized awareness sessions for both doctors and families. Maqatra is a large, mainly rural, district with many isolated villages. At the medical center I met a mother with her two children who arrived around noon after walking seven hours from their village. Both children had conjunctivitis. The mother told me there were many cases of Leishmaniasis in the village because animals live inside homes together with the families. Next month, we plan to launch a campaign against this illness. (Leishmaniasis is a parasitic disease spread by the bite of infected sand flies that can cause large, painful and disfiguring body sores.) The disease spreads mainly during this time of the year so we time our awareness campaigns for November and use sprays to get rid of the disease. I was struck by the stories I hear about people in the village who try to get rid of the disease by rubbing certain kinds of plant leaves on the children. This is a traditional method to deal with a disease, but the problem is that the plants don’t cure the disease and can cause burns. I saw one girl who had burns inside her mouth after being treated with such a plant. We’ll target this area in our awareness campaign in the hope we can stop this “traditional medicine” that seems to cause more harm than good. This morning, we were wakened by the sounds of three large explosions. We were told the target was a main government building in the city. It is situated in Inma, the zone where we found refuge during the battle for Aden, because it was one of the safest places to be. Friends who live there told me the blasts shattered their windows. Even though we were a long way away, it was still very frightening. Before this morning’s explosions, it felt as if Aden had become more peaceful. We no longer heard explosions and the focus of our work was on reaching as many neighborhoods and communities as possible, especially those most affected during the heavy fighting that took place in the battle for control of the city. I’ve been working such long hours that I don’t get to see my family as much as before. Thankfully, the Eid holiday was an excellent opportunity for a family gathering. On the ground, we are witnessing a kind of “Marshall Plan” as reconstruction has started and new concrete buildings begins to take shape. Many buildings – especially health and education ones – are being rehabilitated or entirely rebuilt. Schools that were destroyed during the fighting have all been wonderfully rebuilt. Our children start the new academic year today in a fabulous school room decorated to help them overcome the fears that have accumulated during the months of horror. Hospitals now all have electrical generators. International Medical Corps now supports much of the primary health care in Aden and we distributed medical supplies and other equipment to many health centers. We are also currently training doctors and medical teams on how to report about their work and their needs to the Ministry of Health so those working at the ministry can accurately keep track of the situation here. In Aden we have also trained medical personnel on nutrition awareness and community management of acute malnutrition. During the last two weeks, we have trained around 52 hospital staff members. We have also fixed refrigerators in accordance with international standards. Last week, we organized a carnival to focus on breastfeeding awareness. During the ceremony, our volunteers presented a play created for illiterate women to highlight the importance of nutrition, breastfeeding, handwashing and how to avoid conjunctivitis, which has spread widely here in the last few months. The pressure I feel right now is extreme. I work day and night, even from home at night. The war has changed Aden. It’s like we all were in a coma and then suddenly woke up. We haven’t moved back to our old neighborhood of Touwahi yet because there is no electricity but we are hoping to return tomorrow. The owner of the place where we’ve been living now for months since we first fled the fighting needs to rent the apartment so we are under pressure to go. The news from Touwahi is sketchy and the truth is we don’t know what’s really happening there. We hear bombing but we don’t know where it is coming from. There are rumors about new invaders but we don’t know if this is true or not. The last time I was there I felt Touwahi had become a sad place. People are scared. This is not so in other areas. People constantly hear the sounds of fighting—explosions and small arms fire—but they don’t know who is involved or for what cause. We don’t watch the news on TV anymore because it just makes us more frightened. We see enough horror in our daily lives. Why should we watch more on TV? Two days ago, for example, a man on his motorcycle was killed in Touwahi. He was on his motorcycle close to a coffee shop. He wasn’t a politician. Just a simple cook. No one knows who shot him or why, only that he was killed in cold blood. When the war was raging in Aden we were constantly scared. Now we live in a time of uncertainty, a time of the unknown. I will go back to Touwahi, but I don’t know what awaits me there. This is our second week back in the office. Thankfully, we found it unaffected by the fighting. I am truly relieved. My dream of returning to my home and my old office has come true! My family and all my colleagues are safe. My family and I will move back into our home in Touwahi tomorrow (August 6th). We are waiting now for electricity and running water to be restored. At work, we are currently working on a reassessment of the damage that occurred during the fighting and what it means for those we are assisting. We did an initial assessment earlier but now we are evaluating the most urgent needs of the people and the local health organizations we work with. It’s a major challenge because we are now supporting 38 medical centers, four mobile clinics and two hospitals in Aden and Lahij alone. The reassessment also includes training needs for medical staff members. The sad reality is that bombing has ceased but the humanitarian crisis is unprecedented. We are especially worried about child malnutrition which has been on the rise since the war started. Street fighting has intensified over the last few days in and around Aden, with many killed or wounded. I was at the hospital last Monday, working to help save the wounded. Today, the city is under siege. Our head of security has advised us to stay inside and not to leave our homes. I met with a Mercy Corps representative who asked us to help them with training in hygiene promotion. We will start this training soon for IDPs (Internally Displaced Persons). Our health workers, who have already been trained in this field, will visit IDPs to demonstrate the importance of good hygiene practices, in particular washing hands with soap after going to the toilet and before eating and preparing food. Doa’a takes notes at a meeting of International Medical Corps’ Aden team. 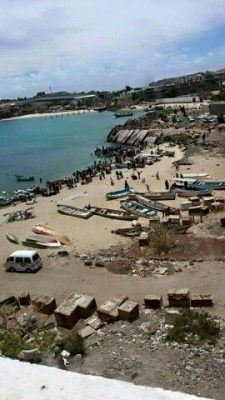 As the bombing campaign continues, groups of locally-based fighters have moved back into some areas of Aden, including Khour Maksar where International Medical Corps’ office is located. This development has left the majority of the people here hoping they might be able to return to their original homes in time for the Eid holiday that marks the end of Ramadan. I have a strong feeling we will be able to work from the office after Eid. My old neighborhood of Touwahi remains completely sealed off. I tried again to go back but was denied access. I was told by former neighbors who had just left that it is like a ghost town. People are not allowed to move even inside the neighborhood and it is forbidden to turn lights on. I don’t know if my house is now occupied by someone else or what shape it is in. I only know that heavy fighting continues there, that the Hospital in Touwahi is now a military area and that there are no public services there—no healthcare, not electricity and no water. As for the Eid preparation, we want our kids to feel the joy of the holiday. I bought new clothes to my little boy and we are preparing special sweets for the occasion. In my role as a volunteer at the Save Aden Campaign, we collected gifts and Eid donations from wealthy Yemenis from around the world. We are doing this even during Ramadan, so where the IDPs have gathered, there have huge Iftar meals for the families when they break their fast. Because supplies of cooking gas have run out, we have switched to using an electric stove. Still, both electricity and water remain scarce. Thanks God we have this strong social and community support. Doa’a and a few of her team members prepare a truck to distribute medical supplies. Ten days ago, we moved to another apartment in the same neighborhood – Inmaa. We needed more space. We are now 12 people in a three-bedroom apartment. I am with my husband and baby, my parents, my two siblings and two of my friends and their children. It has been very hectic because this is the second time we have moved in just six weeks. I cannot describe my feelings being displaced but at least we have a place to live. The holy month of Ramadan, the month of daytime fasting, started terribly. On the first day, people everywhere were crying because we thought the war would end and we might be back to our homes to celebrate Ramadan. Instead, we continue to experience the shock of displacement and the trauma of bombing. Our neighborhood was bombed during the first days of Ramadan. A woman and her three boys were killed. In many IDP settlements, rockets were fired. In Al Mansour, one mile away, 34 people were killed when 12 rockets were launched at them. It’s hard to remember this used to be the safest neighborhood in Aden! We still have electricity on and off but only for three hours at a time. One of the ships carrying International Medical Corps medical supplies and kits was attacked when it approached the port of Aden, so we were unable to get them—even though they are so badly needed. Because the bombing targeted oil storage tanks, Aden’s sky was black for 10 days. It could have been an environmental catastrophe. Al Sadaqa hospital has not been operating for weeks now because it is located in the middle of the fighting. Still, we are trying to reopen it. It is not easy because staff members have not had their salaries for four months now. We are trying to locate and repair equipment inside the hospital that was damaged during the air strikes. While working on these kinds of emergencies, we are also trying to keep going with our routine work of supporting those families and individuals displaced with urgently needed supplies. We are also continuing our women and children health program. In my neighborhood I helped a woman give birth, accompanying her to a hospital so she could receive a Caesarian-section. Because of the war, women giving birth cannot reach the few functioning hospitals. Checkpoints are still everywhere and the lives of these women and their babies are in danger. I am also working with several NGOs in the fight to contain malaria that is spreading across Aden. The mood is dark. People are depressed and angry. The Geneva talks yielded no tangible results. What is happening here is not fair. Still, despite the difficult living conditions and limited resources, we try to serve the traditional dishes for the evening meal that breaks the day-long fasts of the holy month. We hope for a better Ramadan at home next year. Editor’s note: Poor communications and deteriorating security have made it extremely difficult to reach Doa’a in recent days. We continue to try. A situation report from our Yemen team about activities between June 21-25 in Aden included the following paragraph about conditions in the city: The mobile phone network is down most of the time as well as electricity. Internet service is down in many areas where staff are residing. The situation in Aden is worsening on a daily basis and members of our staff feel increasingly insecure. The majority of the International Medical Corps staff have fled their houses. A week ago I went back to Touwahi, my old neighborhood. I was nostalgic and the emotional bond with my original neighborhood was strong. I had to go. I left at 7 am. In normal times, the trip would take no more than 30 minutes. It took me 4 hours because of checkpoints and bombings. We were 6 women in a bus. I cannot describe the amount of destruction that I saw. I took pictures of some areas, but there were some places it was too dangerous to photograph because of snipers. If they saw me taking pictures, they would shoot at me. This part of Aden is a ghost city. No one is out and the only movement in the streets are dogs and cats. I passed by the International Medical Corps’ office and remembered the good old days when we used to feel hungry and go out for lunch as a team. I long for these days to return–the days of security and peace. We moved quickly because the area is unsafe and under curfew. Thank God our office is still there. Many other international NGOs offices have been destroyed, but our office remains undamaged. We were stopped at a checkpoint, but because we were all women they let us through. At the checkpoints we heard strange music. I could not hear the songs well because we passed quickly but the words were unclear. At the entrance to Touwahi where there had been heavy fighting, houses were razed to the ground. Looking at those ruins, there was no sign left to remind someone that this was once a neighborhood alive with people–with schools, kindergartens, a university, shops, and even the electricity company. Now there is nothing left. As we entered Touwahi all of us gasped. It was empty. You could only smell the sea. I was overwhelmed. We entered the narrow back streets and I managed to meet those who had stayed. My uncle was among them and I thanked God that he was there safe and alive. We had heard no news from the area because all lines to other parts of the city had been cut. People welcomed us with wonderful smiles. My father is well known in the neighborhood and everyone started shouting “Koutbi’s daughter is here”! They asked me if I was staying and when I said I have to go back to my son and husband, they pleaded with me to stay. I explained my mother, who recently underwent surgery, also needed me. We cannot come back now because there is neither electricity nor water. I quickly ran to my home and took essential things that I hadn’t been able to carry when we fled. I wanted to go to the clinic but was told it has been taken over by the militias. I remembered the images of innocent people who were injured and taken to this clinic. People told me the hospital is open only from 8 am to 1 pm and receives only special cases. The central hospital – Hospital Basheed – is now closed. When we got onto the road back to Inmaa (where I now live), I thought the way back would be similar to the trip into Touwahi. But we were stopped at a checkpoint occupied by Houthis. They refused to let us go further. We waited there for four hours. Then they started firing at the waiting vehicles, shooting the tires and at the gas tanks so the cars couldn’t move. We ran as fast as we could to take cover as the shooting became more intense–and wild. There was a woman with her toddler with us who were also denied access. They also had to run when the shooting started. As the shooting continued, one young man was hit, obviously badly wounded. I subsequently found out he died 3 days later. We eventually made it back to Inmaa. Along the way, we saw that the garbage and mosquitoes were spreading everywhere. When I returned, I met with my team and we decided to launch a cleaning campaign. It was clear that people are now dying from illnesses and not from the war. On June 9, we launched a big environmental campaign in Aden and Lahj. We don’t have all the equipment needed for such a campaign but we are working hard to get it and move it where it’s needed. We started spraying mosquitoes with pesticides because dengue and malaria are now prevalent in Inmaa. The campaign is sponsored by International Medical Corps. We coordinated with the National Malaria Control Program at the Ministry of Health, Qatar Charity, and volunteers at the Save Aden Campaign. With more than 200 volunteers, we also cleaned our neighborhood. While working on this awareness campaign (distributing leaflets to our community), my son and I came down with dengue. We are now slowly recovering. There was heavy shooting in our neighborhood two days ago but today things are quieter. I pray that the Geneva meeting will end this war. Our location is the safest in Aden. Still, we constantly hear bombing—a reminder that a humanitarian catastrophe is taking place. I was planning to return to my neighborhood with my husband and child but it is dangerous and there is no electricity or water there now. I wanted to go back to help my neighbors and assist the doctors at the hospital close to where we lived. I’ve heard many people were killed and bodies of dead people are scattered in the streets and that illness is spreading, especially malaria. The Kreiter municipality is the most severely affected area of Aden. It is completely sealed off from the rest of the city and residents are drinking well water. Malaria is spreading. I contacted the Ministry of Health and the World Health Organization asking if they could intervene immediately. I am now gathering more information about the health situation and will soon have a complete report. I am coordinating daily with the Program Director at the Ministry of Health and we are working on a campaign to save the residents of Kreiter. The Program Director of the Ministry of Health expressed his gratitude for our efforts. He even wanted to send International Medical Corps a letter of appreciation. I thanked him and asked him to do it when the war ends. Now is the time to focus on assisting my people. I am in contact with Kreiter residents by phone to get as much data as possible and am also meeting with those who managed to flee the area. According to these people, residents are living between garbage and sewage. Six of my family members have malaria. They are now being treated at hospital. What are my days like? Since our displacement to Imaa (the Mugammaa Inma al Sakani area of the city), my life has turned upside down. In this neighborhood, we have electricity for just 12 hours a day. That makes it very hard, especially because of the heat. Temperatures reach 108 degrees. When power comes back, the first thing I do is turn on the washing machine to wash our clothes. Every day, I wake up at 6 am. I prepare breakfast and help my mother who still cannot walk because of a surgery she had in her leg. I make sure she takes her medicines. Living is crowded at my uncle’s home. We are now 22 persons in a temporary 4-bedroom apartment. In addition to my family members (parents, uncle, aunt and their children), I invited 2 women friends—both divorced—with their children to move in with us. In our culture, it is not easy for a divorced single mother to live alone and the war makes things even more difficult for them. In the morning, men queue for hours to get bread. Prices are crazy. We need to pay 1 USD per person. Not everyone can. I know people who buy a small piece of bread, then share it among 3 individuals. Yesterday, there was no bread at all so I had to make it at home. After breakfast, I leave my son with my sister and run to our warehouse to meet with our International Medical Corps team: nutrition, health, sanitation, security, finance and logistics specialists. Our finance staff member can no longer do his work because there are no banks open so he now helps with other administrative and humanitarian tasks. We meet as an emergency team, not as a department. During the meeting, we agree on what each of us needs to do before the day ends. Because of the hot weather, we continue our work from home at 3 pm. We continue to deliver hygiene and food security kits to those new arrivals displaced by the fighting. We can reach them easily because they are now in relatively calm areas. We are also distributing food vouchers to every family. After work, I help out at home and chat with my cousins and friends. We don’t have internet which leaves us starved of information. The other day, I walked for almost one mile to an internet café, only to find out that they had no connection either. Every night, before going to sleep I cry. It is not easy. The holy month of Ramadan is approaching and conditions at home will make it impossible to fast and celebrate in the evening as we always have in the past. I hope no one ever experiences displacement. One piece of good news though: my friends –the local humanitarians I was so worried about–were finally freed by their kidnappers. They were tortured and had to share the one meal they were given each day among the five of them. Thanks God their nightmare ended and they are back with their families. 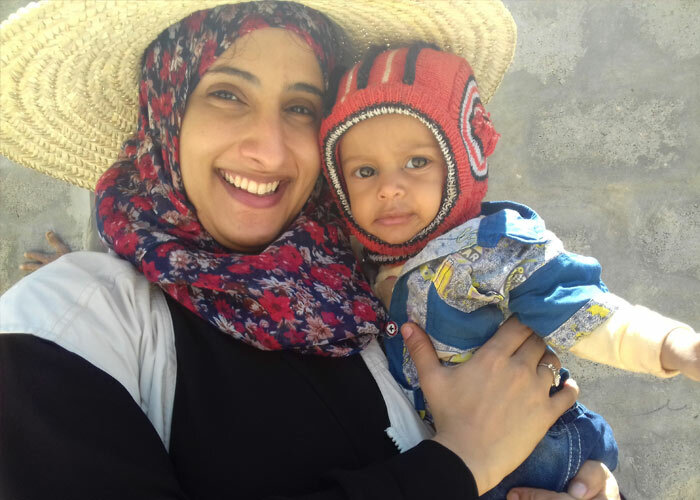 In the days before the Humanitarian Pause began on May 12th, International Medical Corps Health Program Officer Doa’a Kutbi Omer was forced to flee her home in Aden together with her husband and young baby after her neighborhood came under attack. Finding refuge with relatives in another part of the city, she has resumed her humanitarian work with International Medical Corps, helping establish a new health care clinic to serve the thousands of displaced people who have crowded into the area in hopes of escaping the fighting. In the blog entry below, she describes her work, her life as a displaced person and the terrifying uncertainty of what will come next. The cease fire started Tuesday night (May 12th). We used this period of calm to distribute emergency, trauma and surgical kits to hospitals and medical centers in 6 governorates. I wanted to go back today but my family refused. In the area where we are now—the Mugammaa Inma al Sakani, or simply “Imaa”—things are relatively calm. We feel secure, but electricity and water are both sporadic. For now we receive four hours of electricity per day. We have water for three hours, then it stops for three hours, then then it comes back again. In this residential area, there are now 400,000 people– all of them internally displaced who fled their homes. That’s equivalent to half of Aden’s entire pre-war population. I did an assessment last week of the health services in the area and found out there were no medical centers. I called our program manager, who immediately responded. We rented a warehouse and established an International Medical Corps clinic. We are now working 24/7 in the warehouse. We coordinated the establishment of our clinic with the Yemeni Coordination Committee to make sure we avoided any duplication of effort. Because they were also planning a center, we didn’t want to do a parallel structure but a complementary one. My one-and-one-half-year-old son, Sam, needs a measles vaccination but I am scared to do it because of lack of electricity needed to keep the vaccine cool. I am also not sure how vaccines are being transported. It’s a worry. Government employees have now gone three consecutive months without getting their salaries. Schools are all closed. I feel much better now because I am working and attending meetings with our staff inside the warehouse that we rented. During these meetings, we provide updates about the situation, statistics on internally displaced persons, supplies distribution and emergency needs. We also focus on our own individual tasks. Going back to work and feeling that I am helping my people helps relieve the stress. The cease fire officially ends Sunday (May 17th) but we are already now hearing shooting 6 miles away from home. I am unsure how things will evolve. I am also worried about some friends –humanitarian workers from a local group who were kidnapped. We’ve heard nothing of them now for two weeks. I pray for their freedom and safety. I am still in shock of what is happening around me. I always wondered how other people like the Palestinians or Syrians live in war situations. Now I am living it myself and can feel their fears and suffering more. We cannot stop the war on our own but I hope to be able at least to provide humanitarian support to those people in need. In the midst of the current fighting International Medical Corps Health Program Officer Doa’a Kutbi Omer had been helping transfer the wounded to hospitals in Aden. Then, on Wednesday, May 5th she was forced to flee her home together with her husband and young baby after her neighborhood came under attack. In the blog entries below, she describes the struggle to survive in Aden —a city that is just one of the many battlegrounds in Yemen’s rapidly escalating armed conflict where innocent civilians find themselves caught up in the fighting. For all of us living in Aden’s Attouahi neighborhood, last Wednesday’s events were terrifying. First there was the sound of bombing over the city, then around 2 a.m., the mosques started calling on people to leave their homes because conditions had become too dangerous for us to remain. Snipers had already taken up positions in the neighborhood and the area was besieged. Everything moved so fast. Together with my husband, my baby, my parents and my sister, we just ran. We left almost everything at home behind. I managed to take some milk and clothes for the baby and my laptop. My mobile phone wasn’t charged when we left so I couldn’t communicate with anyone. Attouahi has always been a relatively calm and quiet neighborhood. It was only a few weeks ago that a large group of displaced people came in and settled briefly. Now we are all displaced–some for a second time in just a few weeks. We got on a bus and were stopped several times at checkpoints. We could hear there was a lot of shooting. We didn’t know where we were going. We just knew that if we were going to survive, we had to flee. My mother just had a surgery on her leg and could not walk, so we had to carry her. The bus, with 15 people aboard, head in the direction of the port. When we arrived there, there were thousands of people queuing, but we knew we couldn’t wait that long. I will never forget that scene. We saw people who had gotten onto (small) boats screaming as they realized they were being shot at. .I saw people targeted by snipers and killed. Some of them were neighbors and friends. We realized that fleeing by boat was too dangerous so we returned to the bus which eventually took us to a residential area called “Imaa”. We are lucky because we have relatives living in this quiet neighborhood. Other people—less fortunate—have no place to go. In normal times the route to this neighborhood usually takes around 15 minutes, but because we were stopped at checkpoints, it took 5 hours to reach our destination. We are now looking for a place of our own to rent in this neighborhood. But for now, we have no idea what awaits us. We are in shock. We are terrified. 1. What is your job at International Medical Corps and how long have you worked for the organization? I have been working at International Medical Corps for almost a year now as a Health Program Officer. I am 30 years old and I live in Aden with my husband and Sam, our one-and-a-half-year-old baby. 2. What is the situation now in Aden? The situation here is chaotic. Airstrikes and bombings are ongoing. Checkpoints and snipers are everywhere. Basic goods are now in very short supply, especially food. The neighborhood where I live is under curfew and no food or fuel is allowed in. Water is also very scarce. We had no water for three days, then we had it for only 12 hours. Municipal authorities have been unable to collect garbage, so there is a heightened danger of disease. 3. How are you personally coping with the violence and shortage of goods? Just before the war started, I stocked up on essentials, so I have diapers, baby milk and food that will last us until May 20. After that date, I am not sure what we will do. As for the violence, we hear bombing and shooting day and night. We try to remain calm and pray that this will end soon. I go everyday to the medical center to try to help. Whenever I enter the emergency room, I worry I will find a relative or a friend there. 4. Can you describe the humanitarian situation? As the violence continues, humanitarian needs increase. The humanitarian situation is now more desperate than ever. Over the past few weeks, intensified fighting has resulted in a rapid deterioration of conditions in and around Aden and Taiz. If I see injured people within half a mile from my home, I run out to try to save them. I have also been to the Touwahi Medical Center on several occasions to do minor surgeries. There are no surgeons there who can perform the kind of operation needed to repair major war wounds. This means that the lives of those who are badly wounded are in serious danger. So far I have been involved in 17 first aid interventions and minor surgeries to assist injured men who arrived at the medical center. 5.How are medical facilities and health workers managing to function in such difficult conditions? Medical facilities are running low on life-saving medicines and equipment. Emergency services and surgical capacity are overstretched. Al Markazi hospital has no electricity at all. 6. How are our programs being affected by the conflict? Two weeks before the war started, we designed a contingency plan by setting up five mobile clinics to reach as many affected areas as possible. Some areas where the fighting has been heaviest are no longer accessible to us. We hope to be granted access to these areas again soon so that we can provide people the assistance they so badly need. One of our mobile clinics is located in Al Millah district. Our nurses staffing this mobile clinic treated 77 wounded and collected the remains of 13 persons who had died. Our normal programming, including WASH [water, sanitation and hygiene], nutrition, health, and acute child malnutrition, have continued to operate despite the challenging conditions. 7. What are the priority needs? Our priority needs are access to health centers, food and security. Allowing humanitarian access is definitely a must. On the other hand, people need cash and freedom of movement to be able to buy food. 8. How are you able to work under such difficult circumstances? In my neighborhood, we had no power for 15 days. I could not reach my team during that period. Now I am in contact with them by phone and Whats App [a free smartphone app that enables people to exchange text messages at no cost]. We try to do our best not to disrupt our normal programs while remaining alert to assist with emergency cases. International Medical Corps mobile medical teams are on the ground working to provide lifesaving medical treatment and nutrition services in some of the hardest hit locations in Yemen. We are delivering vital medications and other supplies to primary care health facilities in Sana’a, Taiz and Lahj governorates and providing essential emergency medicines and medical supplies to hospitals in Aden, Taiz, Sana’a and Harad cities, and in Lahj and Al Dhalah governorates.